After a beautifully scenic descent into Anchorage, and after making sure everybody had their baggage (ahem, Tony…), we walked outside into the beautiful Alaskan air to meet our tour guides. Patrick (or Francois, according to Claudia) and Todd met us outside of the baggage claim area in their Levis and crew neck sweatshirts. 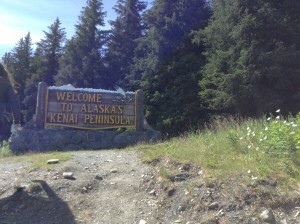 They were personable and welcoming, just like everyone else we had met in Alaska so far. 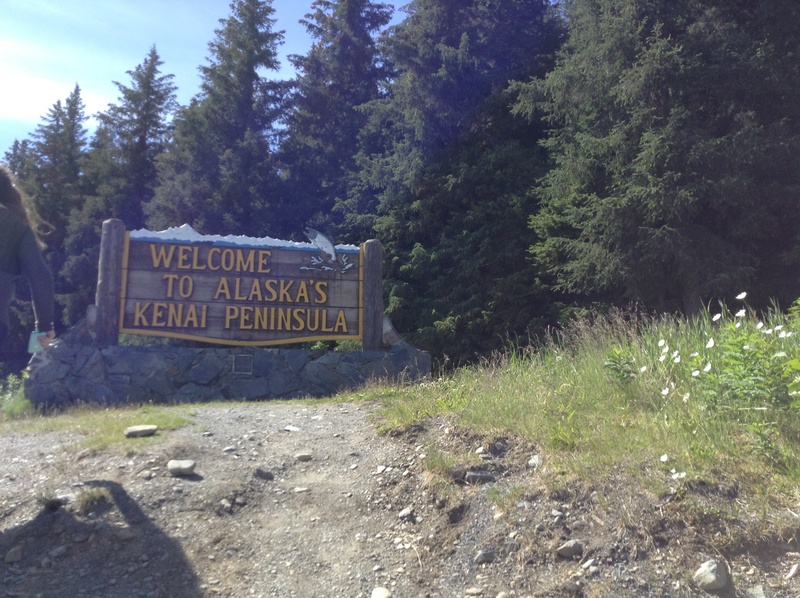 From Anchorage, Patrick and Todd drove us to Seward, which is on the Kenai Peninsula. It was about a three hour drive because we kept stopping to look at the beautiful scenery. The water with the backdrop of the mountains was breathtaking. 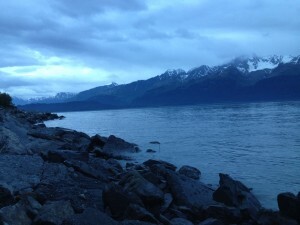 Hours after our departure from Anchorage, a tired group arrived in Seward. This beautiful coastal town was truly one of the prettiest places I have ever seen. I think the group would agree that even though we were in the middle of this place, it still didn’t feel real. It felt like we were living in a scenic postcard. That night we all got to sleep in real BEDS, which was absolute Heaven. After spending so many nights on a floor in a sleeping bag, a clean bed felt better than ever. We also all were relieved to have easy access to showers and unlimited warm water again. Even Nico finally showered (his first time to shower since we left Omaha). On our first full day in Seward, we were lucky enough to ride in a big boat to see some ocean wildlife and glaciers. That all-day boat ride was probably my favorite thing we did in Seward. 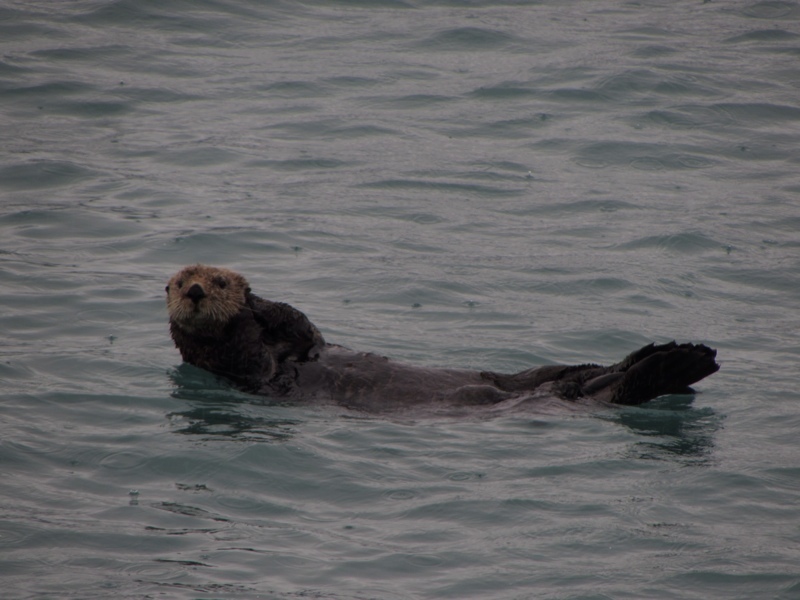 The dreary weather that day was perfectly suited for seeing whales and sea otters, among other things. The glacier was enormous, and we got to watch parts of it falling off. The ride back to the dock was amazing because the skies cleared and we were able to get some incredibly beautiful photos of the mountains and some animals. 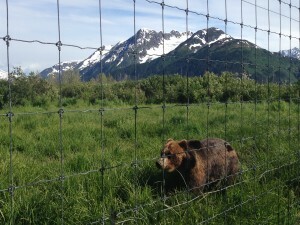 The next day was our last day in Seward, so as Patrick and Todd drove us back to Anchorage to catch our flight, they stopped at a wildlife reserve. We got to see moose, caribou, bears, and wild eagles, just to name a few. That night as we slept peacefully and comfortably in the Anchorage airport (haha…), we all dreamt of the beauty that is Alaska, and reflected on what an incredible few weeks it had been. Both Bethel and Seward offered such different experiences and I am so grateful to have been able to see both sides of Alaska, the native aspect and the tourism aspect. Quyana, Alaska, for showing us your hospitality and beauty. (Sea) Lions and Bears?! OH MY! Seeing the wildlife was my favorite touristy thing to do. 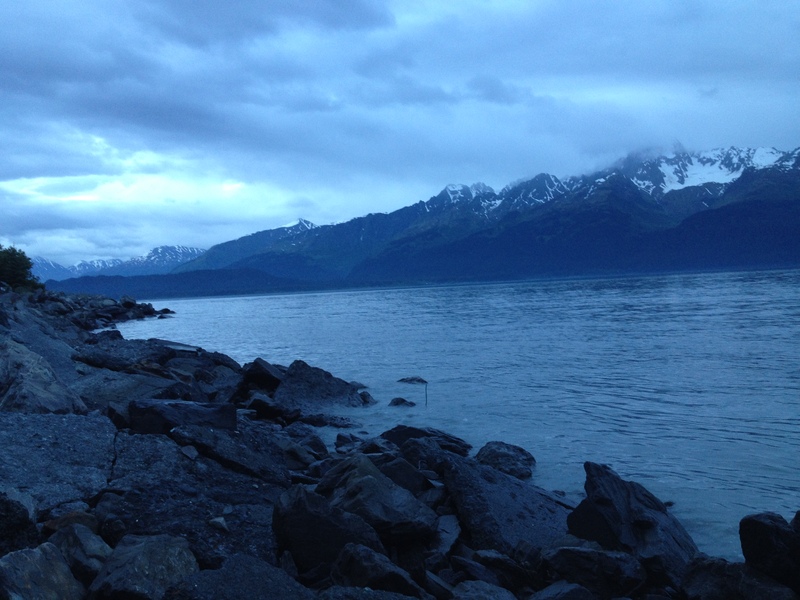 Our trip in Seward was certainly one to remember. Just I was starting to get used to the wide open spaces in the tundra while we were in Bethel, we flew into Anchorage (cell phone service?!) and were immediately on our way to be a tourist for the weekend in Seward, Alaska on the Kenai Peninsula. It certainly was a change of scenery going from tundra to being surrounded by tall trees, massive snow-capped mountains, and the sea. 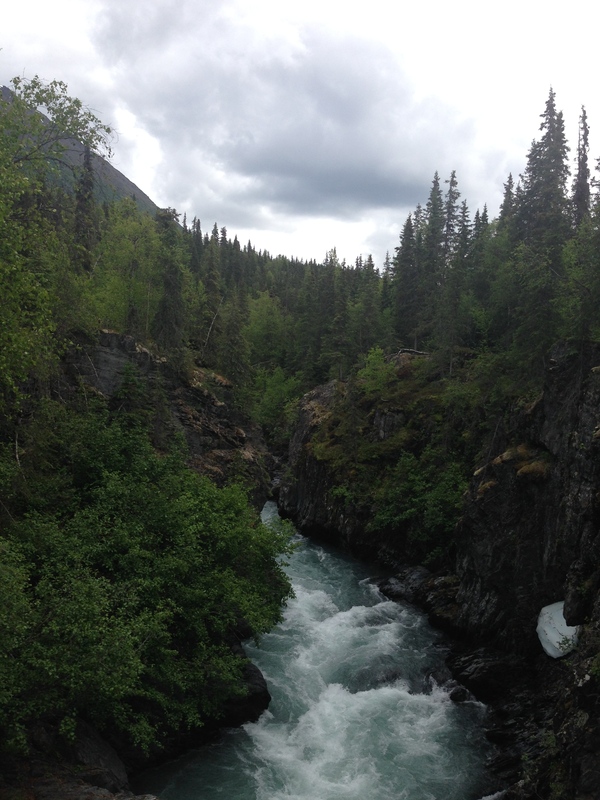 I couldn’t help but get progressively more excited as we traveled deeper into the mountains and Kenai Peninsula. 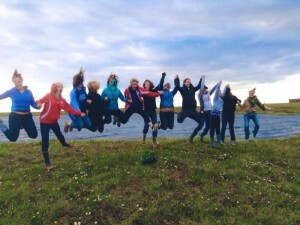 Our tour guides were the best, and certainly knew all of the places to stop to get the perfect Alaskan pictures. Some of the places we stopped at included the largest Alaskan water plane “airport lake”, a lookout point towards Denali, and a stop by the “Welcome to the Kenai Peninsula” sign. That Saturday we saw tons of sea life. For the first time in my entire life I saw killer whales, whales (sadly no dramatic jumping out of the water pictures), sea otters, sea lions, and of course LOTS and LOTS of tufted puffins. When we got to the glaciers, it was like seeing a giant monster slowly steeping into the sea. It was amazing and really cool to see the ice breaking off into the ocean. However, at the same time it was hard to grasp the fact that these glaciers are calving, and very rapidly. It wasn’t until the next day when we hiked right up next to the glacier that it really struck me that the climate is changing up here. In the car about 6 miles away form the glacier we started seeing signs that marked years dating back to about 1800. As we got closer and closer to the glacier and saw a sign that read about 1960, we were only 2 miles away from the actual ice. When you think about it, thats 2 miles. Melted away in about 40-50 years. Thats when it hit me that this is climate change thing we hear about in the lower 48 is real up there in Alaska. We then started the trek back to Anchorage. We ate dinner and enjoyed the summer solstice festival (longest day in Alaska!) in Moose Town. We stopped at the Alaskan National Wildlife Refugee where we saw caribou, moose, reindeer, LOTS of bald eagles, foxes, owls, and (my favorite) the BEARS! I was only about 6 feet away from one of the bears at one point (of course doubled up and electrically charged fence in between us). This trip for sure made a lot of firsts for me that I will never forget! 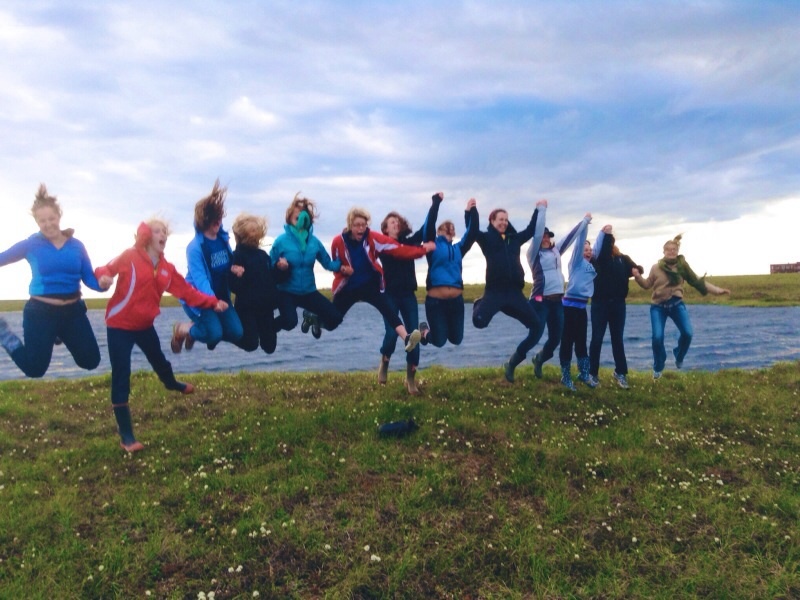 As our trip is finally winding down, I keep reflecting back on my experiences in Seward and in Bethel. The people we’ve met and the sights I had the privilege to see have touched us all in different ways. Some stories touch others more than others. Some stories teach us to reflect on our own lives and way of living more. Seeing really made me believe. And in some stories we find connections and friendships with the people we’ve talked to. No matter what, I realized that each person and everything has a story waiting to be told. 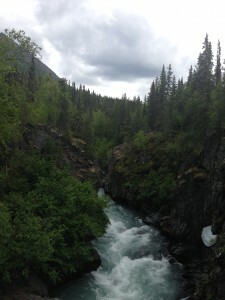 River flowing through the mountains on the Kenai Peninsula. I turns out that I have a thing for sunsets. 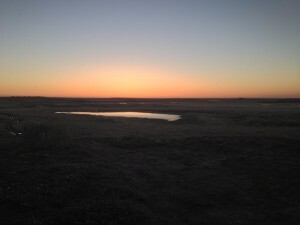 In Bethel, a small group of us went out on the tundra to catch the sunset for the last two nights. 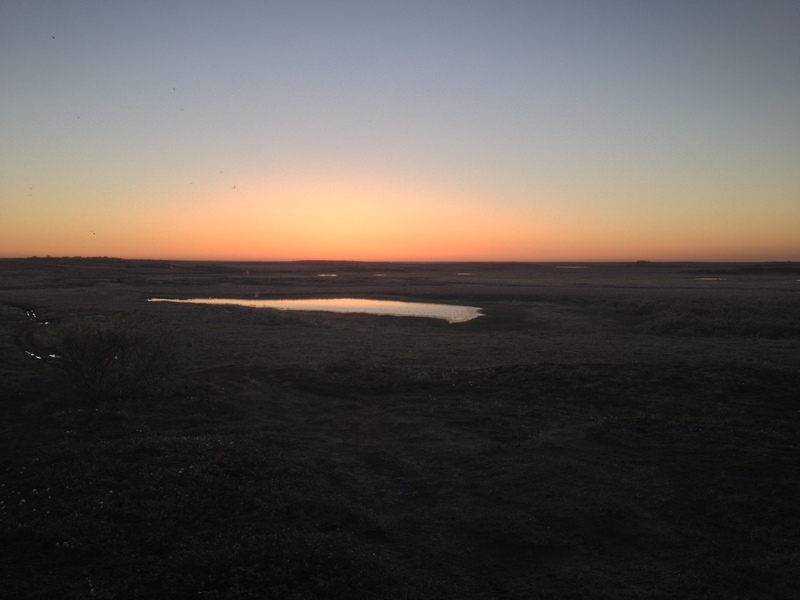 We would leave around 10:30 p.m. to watch the sun “set” around 11:30 p.m. And when I say “set,” it would never really go away, just dip below the horizon only to reappear a few hours later. Some took shots for a time-lapse, others filmed more material for the mockumentary, or some just took a photo with their minds (and iPhones). When we were out on the tundra we talked and joked around or we were silent, just trying to take in the moment with every breath. With my new appreciation of sunsets, we had arrived to our next destination, Seward, Alaska, just in time for the summer solstice. This part of Alaska was much different than Bethel. There were mountains, trees, and roads! A small group of us set out again to watch the sun go down on the longest day of the year. This time we didn’t actually get to see the sun because of the clouds and the mountains, but we watched a show of our own. As we settled on the rocks at the edge of the water, a sea otter came up and ate a long meal right in front of us. We sat there for quite a while. There is something about sitting in silence with your friends before a perfectly serene scene of the blue water, cute wildlife, gigantic mountains, and low clouds. It’s where peace and love for the land is found. It was transcendent—a moment I’ll want to remember forever. 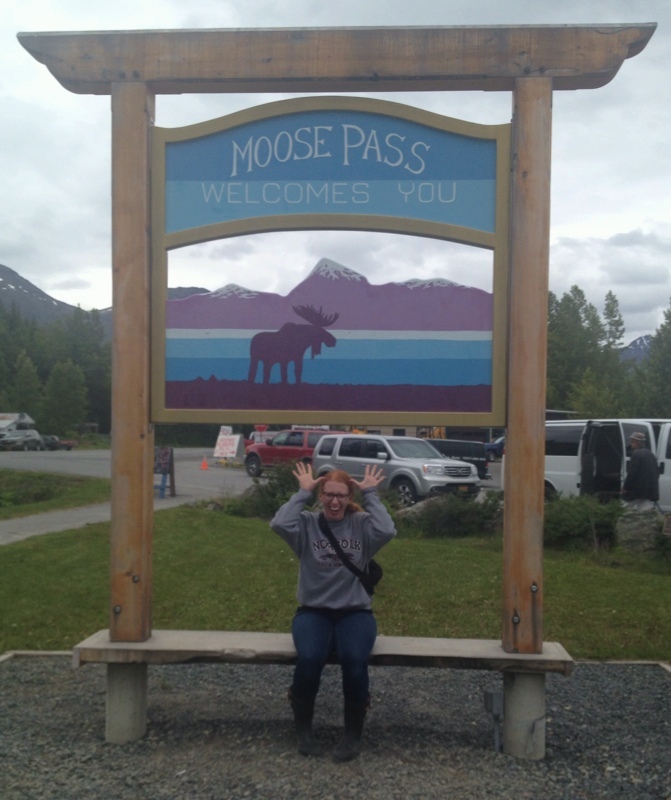 Throughout my time in Alaska, I was on the lookout for my favorite animal, the moose. It is an awkward yet majestic creature, so I find it to be quite endearing. Alaska is the land of moose, so it seemed like I had a good chance to see one during my trip. I knew it was unlikely that I would find one in Bethel because it’s on the treeless tundra, but it just so happened that early on in our trip, four girls in our group going on a walk saw a mama moose and two young calves emerge from the bushes across the Kuskokwim River. I was very sad that I wasn’t with them but still held onto hope that I had many more days of the trip left to find one. By our last day in Alaska, I still hadn’t seen one. 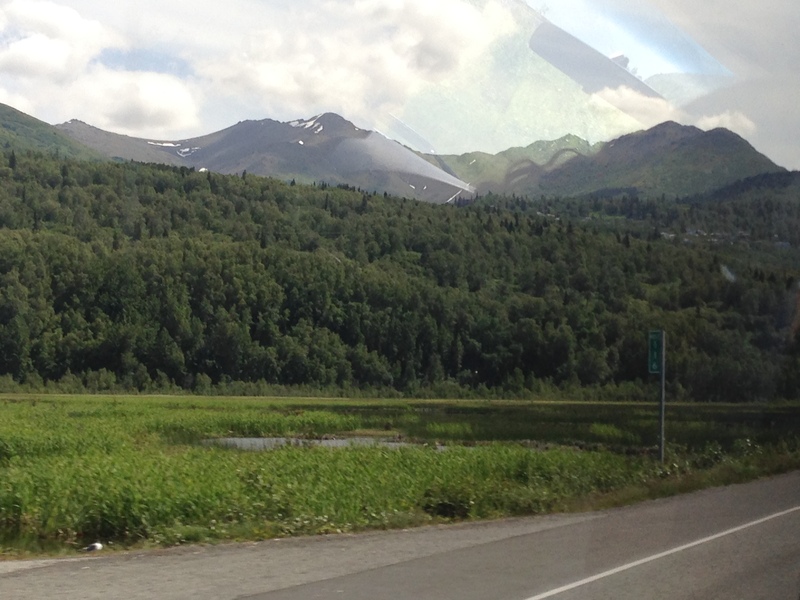 I had looked longingly through the trees as we drove from Anchorage to Seward. We took a spectacular boat ride on the ocean and visited the gorgeous Kenai Fjords National Park, but there weren’t any moose to be found during either experience. We spent time in the town of Moose Pass to experience its Summer Solstice Festival. There I took my picture by a cute sign of a moose, but no moose were passing through at the time. 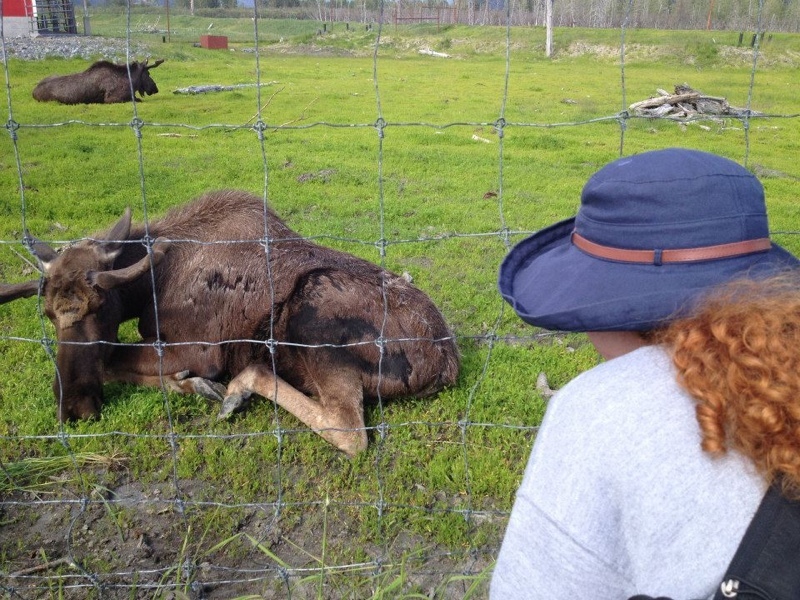 During my quest for a moose, many of my fellow Backpackers wondered why I love moose so much. In eighth grade I visited Grand Teton National Park with my family during summer vacation. As we were driving through the park, I was sitting in the backseat looking out the car window and spotted a brown animal in the thick of the trees. I called out “Moose!” and my dad stopped the vehicle. I jumped out of the car and hurried a few feet back to where I had seen the animal. Sure enough, about a hundred yards in front of me was a female moose just standing there looking at me. My family and I watched it for a while, and soon it turned around and disappeared into the trees. This is where my love for moose began. I still wonder how I spotted the beautiful moose at the Grand Tetons. If I had blinked or looked away at that moment, I would have missed it. A few summers later, my family and I saw six bull moose all at once in a grassy meadow at the Snowy Mountain Range near Laramie, Wyoming, which was an absolutely remarkable experience. 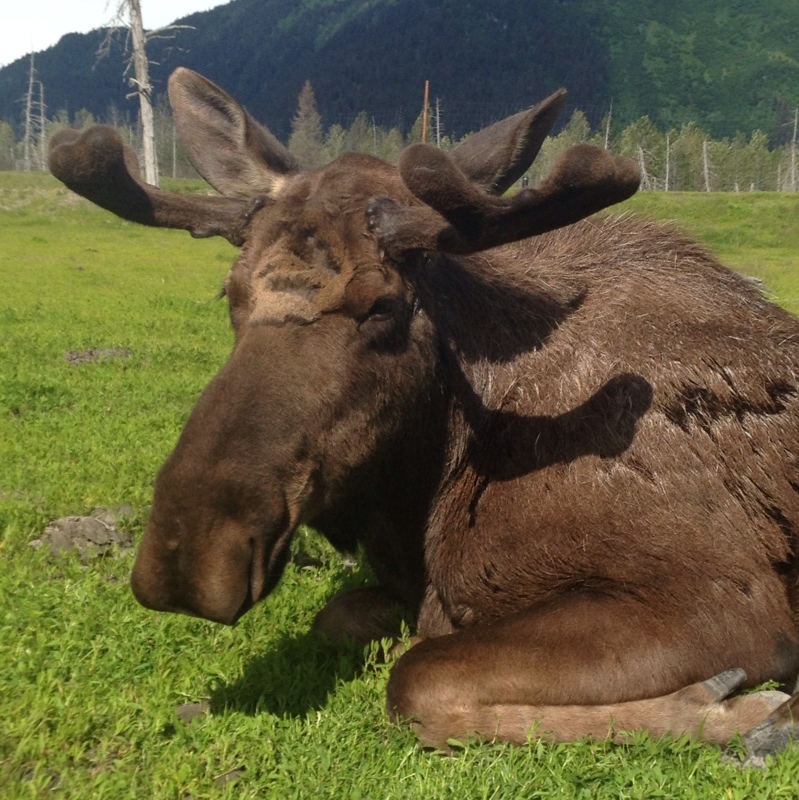 Both moose sightings are two of my favorite memories, so I have a fondness for the animal that made them possible. As I stared out the car window on our way back to Anchorage on Sunday, I hoped that my history of spotting moose would come to benefit me, but as the day wore on I came to accept the fact that I wouldn’t see one, knowing that I had witnessed lots of wonderful new wildlife like orca whales and otters. After leaving Moose Pass, we began our journey through the mountains to our final destination, the Anchorage airport. Then our fantastic tour guide Todd, who knew of my love for moose, said that we had one last stop. Ahead I saw a sign for the Alaska Wildlife Conservation Center, and Todd surprised me by saying I would have a chance to see a moose. Once we entered the park, I quickly hopped out of the van and spotted a moose right away about one hundred feet away. I hustled over to find not only one but two young bull moose with small antlers. They were in a fenced-in area chomping on the grass. One was sitting just a couple feet away from the fence. Words can’t really describe the moment, but maybe a picture can. I was absolutely overjoyed to see my favorite animal up close. I ended up sitting alone with the moose for a couple minutes just looking him. Then I decided to check out some of the other animals in the Alaska Wildlife Conservation Center. It is an incredible place. Orphaned and injured animals are brought there to be nursed to health and taught how to survive in the wild on their own. Black and grizzly bears, bald eagles, deer, caribou and bison were some of the other species there. Before our group left the center, I went back over to the moose, who were now standing and enjoying their dinner of willow branches. As I was taking one last look, the moose turned his head to me, stopped eating and slowly walked over to the fence where I was standing. We just looked at each other for a few moments, and then he went on his way eating his dinner. It was an unbelievable moment I will never forget. I have an even greater appreciation for moose after spending two weeks in Alaska. Because moose is a subsistence species, the Yup’ik people rely on the animal to survive during the fall and winter. Not only is there a respect for landscape in this culture but also for animals. We heard a story during one of our interviews about how a group of subsistence hunters said a prayer of thanksgiving after hunting a moose. Every part of the animal is used and never wasted. The meat is lean and good for children to eat. At the church potluck, I debated eating the moose stew someone brought because of how much I love the animal, but because moose are such an important part of the Alaskan culture, I decided that it would be disrespectful not to try it (and thought is was delicious). Even though it wasn’t in the Alaskan wilderness, seeing a moose up close was a special opportunity and the best way I could have imagined to end my two week Backpack Journalism trip. I will always be able to say I saw a moose in Alaska and also learned about how important and special the animal is to this place. 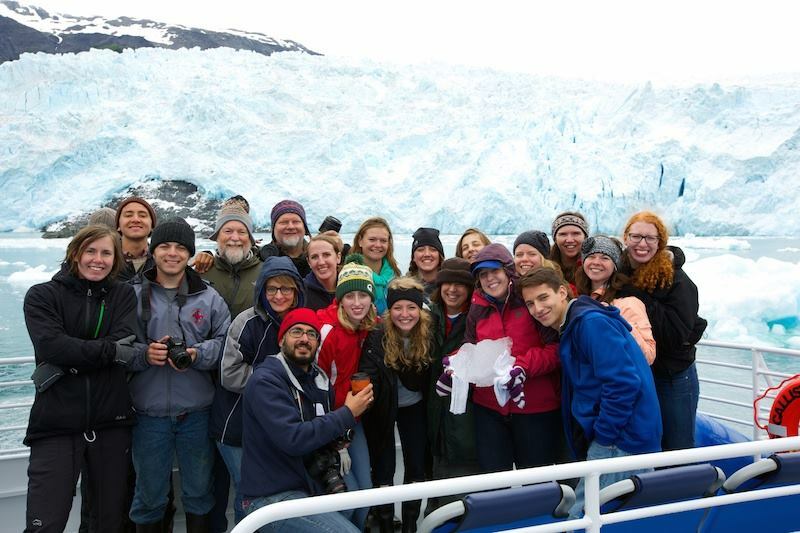 On our last day in Alaska, our touristy group made a trip up to Exit Glacier. I was in an average mood; I was a bit tired, but excited for a scenic hike. I was excited for the thrill of reaching our destination and simply looking at everything around us, and enjoying our last true piece of our time in Alaska. On the way up the trail, my thoughts just wandered. Each little break in the trees, we’d see the beautiful mountains and sky surrounding us, and each time I’d have to do a little spin around and smile with admiration for the beauty that is Alaska. It was hotter than I had expected, so after each little break, I’d rush myself just a bit to get up to the crisp glacier air a bit quicker. The last sign on the way to Exit Glacier. 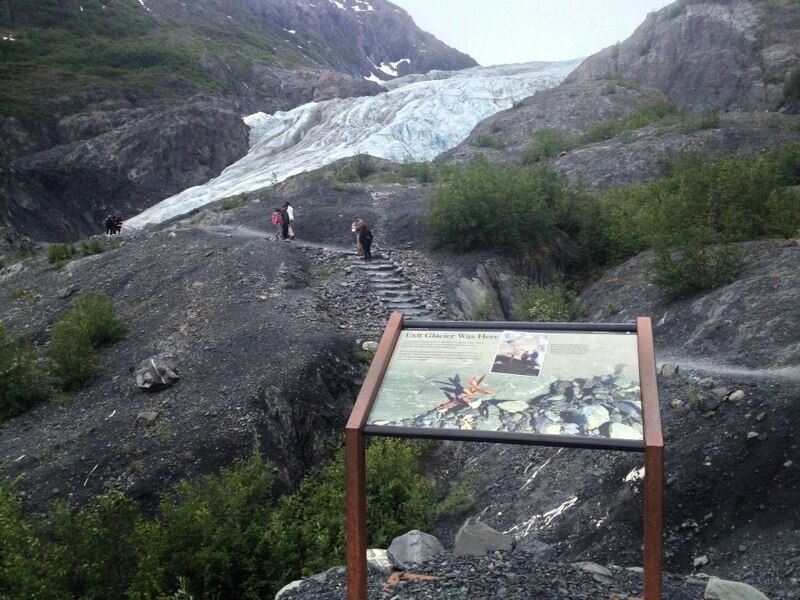 On that sign, it was noted as the location of Exit Glacier in about 1996. After reading, I began to feel slightly off, something I wasn’t expecting, as I finally began to feel the chilled wind from the face of the glacier. I was still a little far from the edge itself, but I began to look around and I slowly realized the true impact of me being there. I watched people walk up to the edge, smile or make a silly pose and get a picture. I watched people take a long look, and then just walk away. 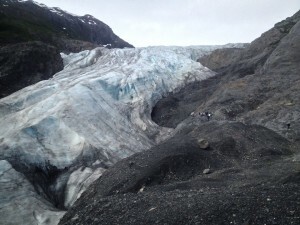 In the most recent exposed rock from the receding glacier, scrapes and scratches painfully dug into the rock were being ran over and overlooked. I suddenly felt disgusted with myself for being excited to be there. I was no longer a happy tourist; I was a mourning visitor. This glacier, this change, had happened and is still happening in my lifetime. I looked at the clawed rock and I saw suffering. I looked at those smiling and taking goofy pictures as ignorant (even though I did get pictures in front of it). This once massive, beautiful structure stood with pride, yet now it is literally melting, receding, and cracking, losing its place on earth. Exit Glacier, as it stands today. In a way I could compare it to the Yup’ik culture we experienced in Bethel. The old ways and traditions were being pushed back, forced, by a new western outlook. The children didn’t want a part of the Yup’ik ways, they want the modern ways, and therefore don’t make room for the culture. Just as the glacier had clung to rocks, trying desperately to pull itself back, those who believe in the Yup’ik culture are trying to bring it back to the people of Bethel. In our times as humans, we lose things. From friends, toys, or games, to memories, material goods, or history, things disappear from our lives and this world all the time. But something made this different for me. It’s happening now. When I was 5 years old, that glacier was bigger; now it’s not. 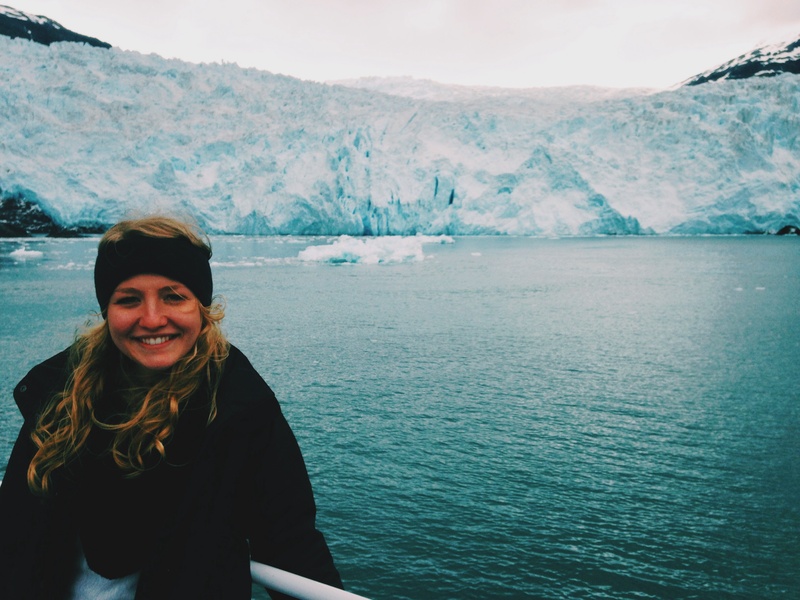 That one moment, standing on the edge of Exit Glacier made me realize the harsh truth of the matter; if people don’t see the importance of things such as culture and climate change, they are just going to keep disappearing. Though I was in no way expecting something from that hike, it taught me something. It showed me the importance of staying aware, and being on the side of seeing importance and value in my history, my traditions and culture, and those of others as well. I’ve learned a lot from my time in Alaska. From all the people and stories and lessons shared, it was all an incredible experience. Yet I got my final push of remembrance and inspiration from that hike frozen in my mind; and it’s one thing that will never melt. 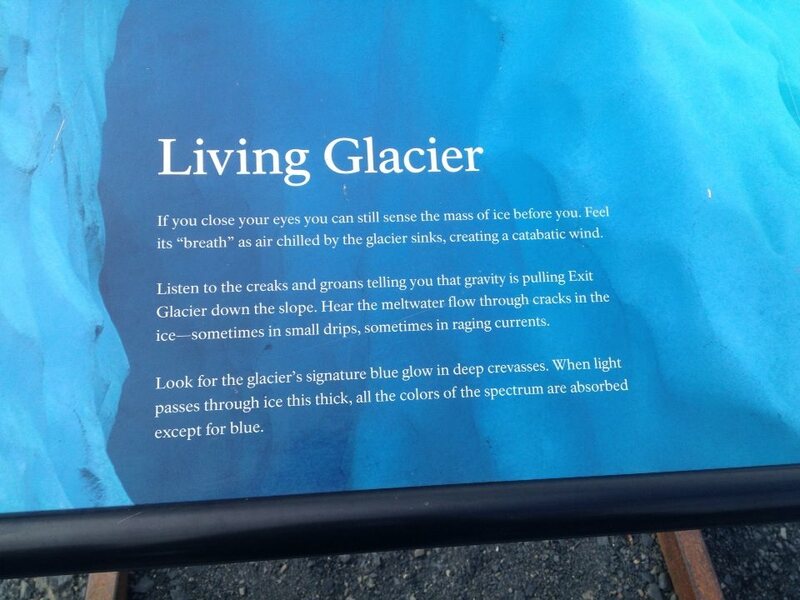 A beautifully written passage about the glacier. I’m still incredibly exhausted, but delighted that I’m slowly re-entering into my normal routine (like sleeping in my own bed and showering every day). That’s so true, especially with our group, who was surrounded by gorgeous scenery over the weekend. Starting Friday morning, we became tourists. The trip shifted focus from learning about others to learning about the nature and landscape of Alaska while snapping a few selfies here and there. We ended our vacation with a “real” vacation. 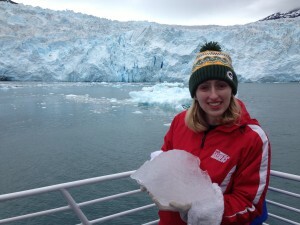 We traveled to Seward, which meant we flew to Anchorage and were picked up by our tour guides. We then drove for four hours in two big vans to Seward. It’s usually a two to three- hour drive, but we made several stops along the way. We stopped at an airfield, watching planes take off and land in the water. We stopped at several places with great views of the mountains. We stopped at the Alaska SeaLife Center in Seward, where we got to see seals and sea lions swim and interact with each other. I liked seeing all of that, but it was a joy to get back in the van to move on. I loved sitting by the window and watching mountain after mountain and river after river pass us by. I still can’t get over how magnificent those mountains are. Yet another view of those mountains. Saturday by far was one of my favorite moments of the trip. We spent all day on a boat, touring the Kenai Fjords Natural Park. The boat had a seating area to warm up but both standing and sitting room towards the back, outside. Saturday was one of the rainiest days of our trip, but it was worth it to stand out in the rain. 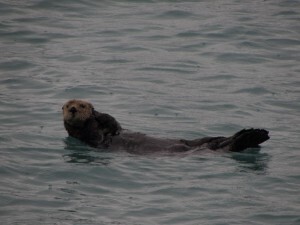 We saw sea lions, sea otters, porpoise (which are like dolphins), humpback whales, orca whales, tufted puffins, horned puffins, as well as a bald eagle during our six hour tour. We then floated past the Aialik Glacier and watched parts of it crumble and fall into the water. If you need proof that global warming really does exist, you don’t need much more proof than that. Standing in front of the Aialik Glacier, holding a chunk of it that has melted off. 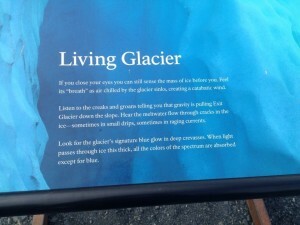 The next day, we climbed to the edge of Exit Glacier, also in Seward, before visiting a little town called Moose Pass, the Wildlife Conservation Center and returning to the airport. 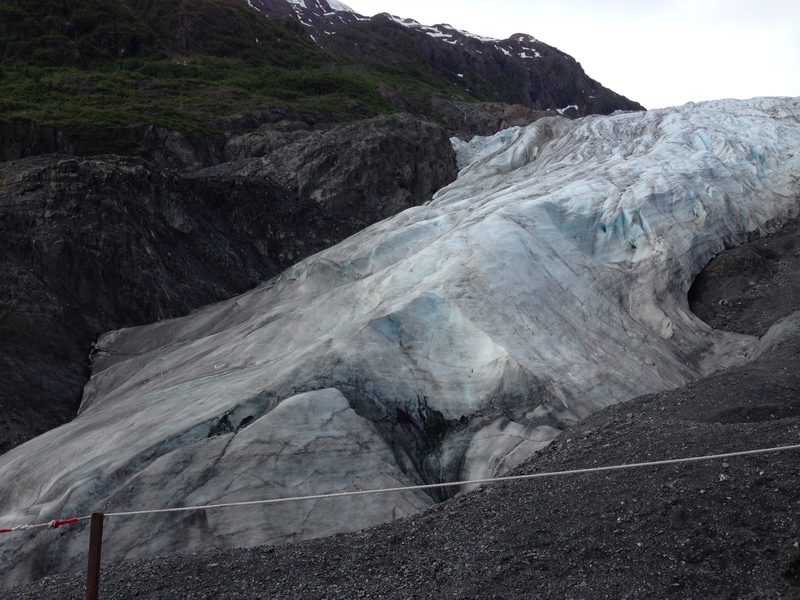 It’s incredible to see the Exit Glacier up close, but it’s even more remarkable to think about how much of it has melted. Along the trail up to the edge of the glacier, there were signs marking where the edge of the glacier was in past years, for example in 1964 and even in the 1800s. It’s nothing now compared to it was back then. In the past, I have had my doubts about global warming. The issue surrounds politics and so many politicians are involved; it’s hard to know who to listen to. I guess it took a trip to Alaska and to this glacier to truly confirm that global warming is real. 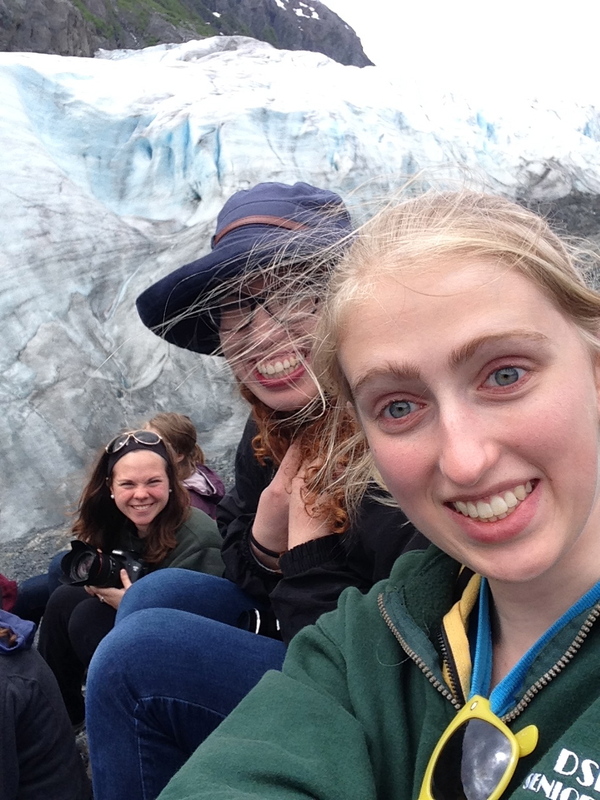 We took selfies by this glacier and now that I look at it, it was almost too appropriate for me to do so. It helped me take a look at myself and what I believe, while letting that glacier appear in the back of my mind, like it did in the back of our pictures, forming my opinion to match what I see. Leah, Hayley and I near Exit Glacier. During the ten days I spent in Bethel, I heard numerous stories about the threats of climate change. I saw the tears of a young college student as he explained the reality of climate change. I heard the fears of Yup’ik elders, who could foresee an ominous future due to this reality. However, it was not until I headed to Seward, AK on our tourism portion of the trip, that I visibly saw the effects of climate change. Saturday, our group had the amazing opportunity to explore the creatures and landscape of the sea on a six hour long boat tour. The views were breathtaking and majestic. The earth stood untouched by humans and the sea was fresh and clear. Unlike most places I have visited in the lower 48, there was no smog or skyscrapers interrupting the nature as it played out before us. I saw dolphins race beneath the boat and leap freely between the waves. I saw six sprightly whales traveling together as a family. Sea lions, tufted puffins, and bald eagles graced our presence as we witnessed the beauty and grace possible when humans are not misusing and abusing the land. 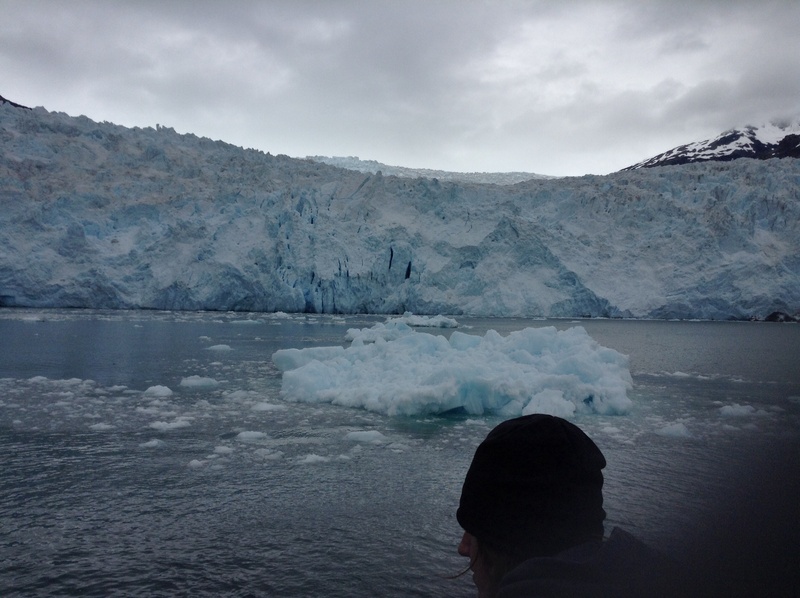 Then, our boat approached a glacier. The first thing I witnessed was its obvious beauty and massiveness, but not short after, I came to notice the chunks of ice floating in the surrounding sea. I then heard large rumbles followed by pounds and pounds of ice crashing to the sea and saw water trickling down the ice structure. With each new drop of water or topple of ice, I thought back to the nature I had just witnessed in the open sea. I thought of how carefree and healthy they seemed living so far from an obnoxious human population. I then came to realize how wrong I was in thinking they were untouched by the human race. Our pollution, waste, and energy needs are affecting creatures miles and miles away from us. With each new ice chunk that enters the sea, the habitat of the dolphins, whales, and sea lions is changing. In this moment, I finally understood why the Yup’ik elders fear what the future holds. Without a drastic change in our current behavior, species, food sources, and the land may not survive, and their literally may be nothing for the future to hold. Today we spend our last day in Bethel, interviewing a few more people and enjoying the town that has touched us over the last 10 days. I know Bethel will always be a part of my story, just as much as I hope we have become a part of its. Every time we meet a new person, whether it’s for an interview or just to get a taste of the Yup’ik culture, I am shocked by how open and willing that person is to tell us his or her story. We’re a big group, almost a force, and most often we have lots of questions about the culture. Every question, no matter how long it takes, is answered well. I am so grateful to have met people like Cecilia, Tad, Sarah, and Stan (the barber in town who took all of us out to his fish camp). They have made this trip so wonderful and so incredible. I was excited to participate in “real journalism” from the beginning. I had the chance to be the interviewer, take notes and listen for good quotes in other interviews, try my best to shoot b-roll and even cover or take notes during a town-hall style meeting. I’ll miss having interviews to go to, but hopefully one day I’ll be interviewing people every day. This is probably the only time in my life I’ll be in Alaska, so I tried to say “yes” to every opportunity I had. I said “yes” to eating lots of salmon, reindeer and moose. I said “yes” to going to a fish camp and just going fishing. I said “yes” to kayaking (and regretted it a little). I said “yes” to exploring the town with my peers at 10:30 p.m. because it looked like it was 3 p.m. outside. Saying “yes” with almost no regrets was a great feeling. I loved not having cell phone service up here. It’s going to be so sad when we travel to Seward tomorrow and our phones will work again. I don’t text a lot on my phone anyway, but it’s been great to take a breather from social media, except to post my blogs on Facebook and Twitter. I will miss taking a break from one world to be completely present in the current one, something I’ve done on this trip. The girls of this fantastic group, having fun on one of our late night walks. Photo Courtesy of Kari Welniak. So to my peers and to Bethel, thank you. For every moment.